At Vinylume, we offer a wide range of siding solutions to give you the leeway to choose from different styles and colors. As a premier source of James Hardie® and CertainTeed products in Fairfield and Westchester counties, our color selection is virtually unmatched. Sticking with your home’s architectural style is one of the basic factors to consider in home improvement projects. Certain home styles have traditional looks that remain stylish even in the 21st century. For instance, you can accent Colonial home’s trademark white with a colorful siding in CT to add a pop of color. This also highlights components in your home, such as the front door or window. Our design expert will offer suggestions to evoke the signature aesthetic of your home’s architecture. Hues change the way they look based on the amount of light available. This is why intense sunlight makes any color seem more vibrant and vice versa. Our designer would help you see how each color would appear depending on the season. You can also use swatches and check how they look at different times of the day. Colors affect our mood, depending on quantity. Dark shades may be energizing in small doses, but they can be gloomily overwhelming when used in large spaces. 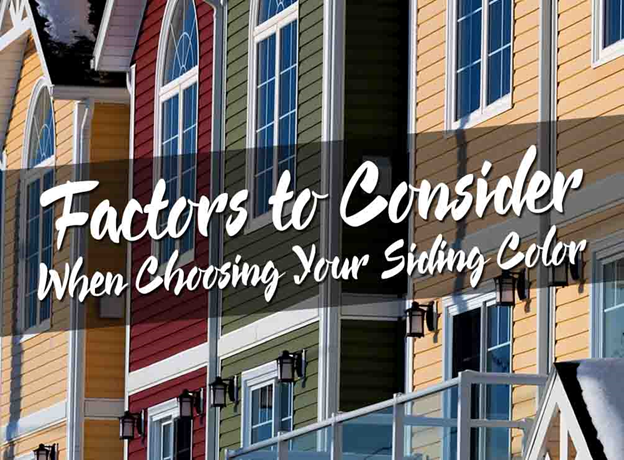 Considering the massive space your horizontal vinyl siding would occupy in the exterior, pay attention to the color’s effect in large-scale applications. You should also keep in mind that lighter colors de-emphasize features that you want to hide. If you want to draw attention to your windows, we recommend darker tones. The surrounding landscaping around your home should coexist with your exterior design. Otherwise, it might look out of place. In most cases, it’s best to draw inspiration from the colors in your own yard. The rule of thumb is to complement, not contrast. Furthermore, understand how your neighborhood is like to make your siding color stand out while still blending in to everybody. Lastly, pay attention to all architectural details that would remain unchanged after your siding upgrade. Take color cues from your existing stonework, roof, and garden to create visual harmony with your new siding system. Create a more beautiful home with these helpful tips from your expert contractor. Let Vinylume help narrow down your color and style choices for your CT vinyl siding. Schedule a consultation today by calling us at (866) 244-8029 or filling out our contact form.